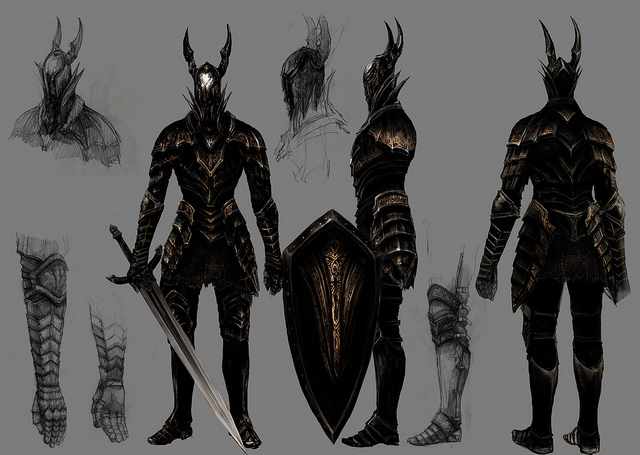 This enemy is clad in fine, black armor, wielding a remarkable sword that seems to be a Great Sword. Often guards rare treasure in earlier levels. While their attacks are very powerful, they're also very vulnerable to a parry by the player, quickly followed by a riposte attack. There are additional variants to the Black Knight wielding different weapons which have a chance of dropping their respective weapons when defeated. Near the watchman's tower of upper Undead Burg. A chance to drop a Black Knight Shield or a Black Knight Sword. Guards the Blue Tearstone Ring. Top of the tower above the The Bridge Wyvern. Wields a greatsword and a shield. A chance to drop a Black Knight's Greatsword or a Black Knight Shield. Near the bottom of the Darkroot Basin. A chance to drop a Black Knight Halberd or a Black Knight Shield. Guards the Grass Crest Shield. In Northern Undead Asylum(after returning), where the first undead archer used to be. Drops a Red Titanite Chunk. In Undead Asylum (after returning), guarding the cell the game started in. Wields a sword and a shield. Guards the Peculiar Doll; This item is needed [[#|to enter]] the Painted World of Ariamis. Directly after first fog wall. Can be encountered by waiting at the fog entrance. Note: Recommend holding shield in ready position, as it is very hard to see. A chance to drop a Black Knight Greataxe or a Black Knight Shield. All four versions (Halberd, sword, greatsword, and great axe). Each of the weapons will drop off their respective Black Knights in the Kiln of the first Flame if your item discovery is high enough. More information on locations and drops needed!